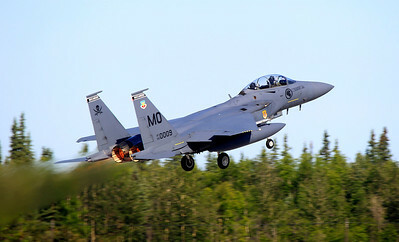 The Royal Australian Air Force has just released a series of photos of Exercise Red Flag Alaska 11-2 which is being held at the USAF's Eielson Air Force Base, Alaska from July 7-22, and will involve participants from Australia, Japan, the Philippines, Singapore, Thailand and the United States. Among the participants captured on camera by the RAAF's photographers are the Republic of Singapore Air Force's (RSAF) Boeing F-15SG Strike Eagles of the 428th Fighter Squadron, 366th Fighter Wing, a joint RSAF-USAF training squadron based at Mountain Home Air Force Base, Idaho. Click on the following thumbnails to view the high-resolution images. Formerly known as Cope Thunder, Red Flag Alaska is a United States Pacific Air Forces Command led large force employment exercise designed to replicate a high-end combat environment. Aircrew will be exposed to large force employment where they perform counter air, precision strike and offensive air support in packages of up to 100 aircraft. The exercise also provides invaluable training for logistics, support and maintenance personnel as they are able to practice deploying to another country and working together with other Air Forces. 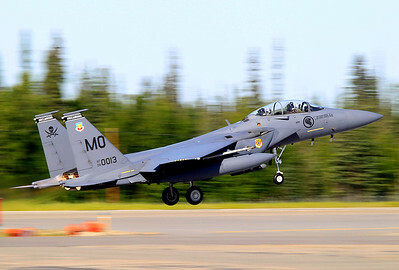 Red Flag Alaska is a large-forces exercise conducted in interior Alaska to simulate air combat. Aircrews will be operating in the 67,000 square-mile Joint Alaska Pacific Range Complex, which offers adequate space and ranges for crews to simulate full-scale aerial battles.